Post-hunt deer populations Utah's estimated number of deer following the general hunt has reached new highs. 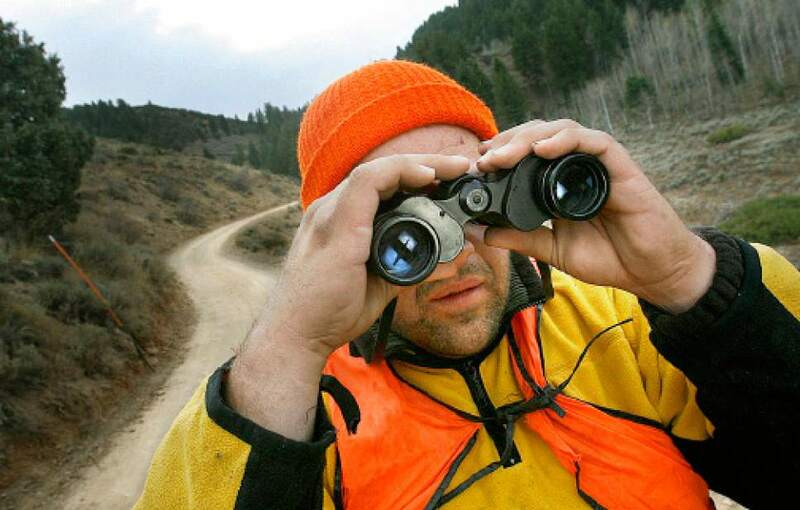 Scott Sommerdorf l The Salt Lake Tribune Ryan Hoyt of Fielding searches the area in Logan Canyon for deer as the three day Deer hunt begins Saturday, 10/23/2010. Not "The Rabbi." 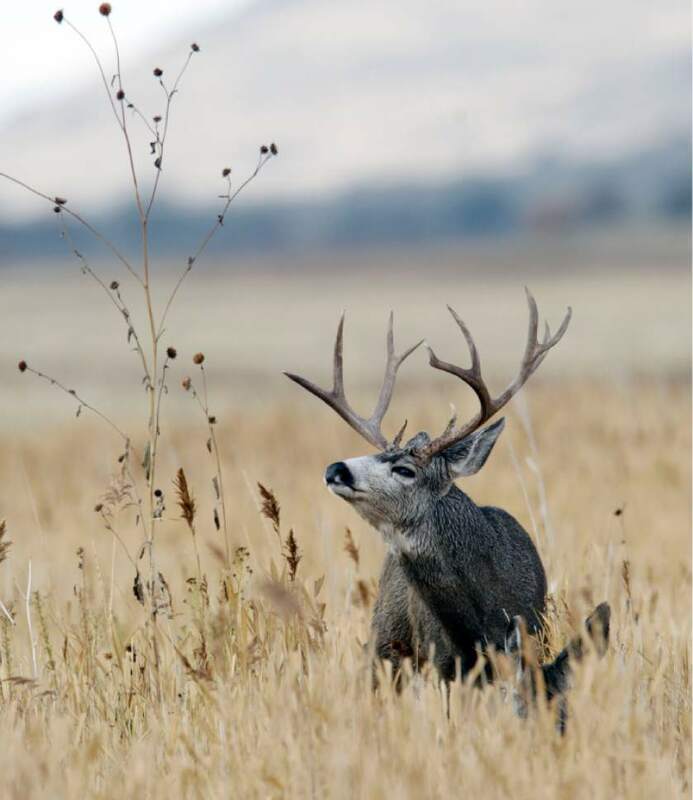 (AP Photo/Utah Division of Wildlife Resources, Brent Stettler) Steve Griffin | The Salt Lake Tribune A mule deer looks up while grazing in a field near Tabiona, Utah Monday July 30, 2012. 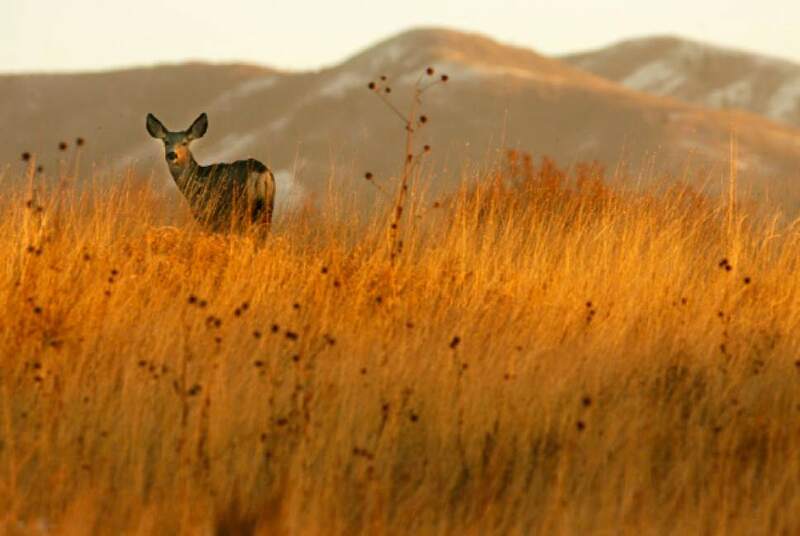 Al Hartmann | Tribune file photo A buck Mule Deer looks over a doe laying in deep grass, (below right) near the Fielding Garr Ranch on the east side of Antelope Island. Al Hartmann | Tribune file photo A buck Mule Deer looks over two doe near the Fielding Garr Ranch on the east side of Antelope Island. Colton Thompson, 16, (right) of Clinton Austin Bennett, 16, (left)of Riverdale scope the hills and forest near Six Bit Springs in the Monte Cristo area of Cache National Forest. 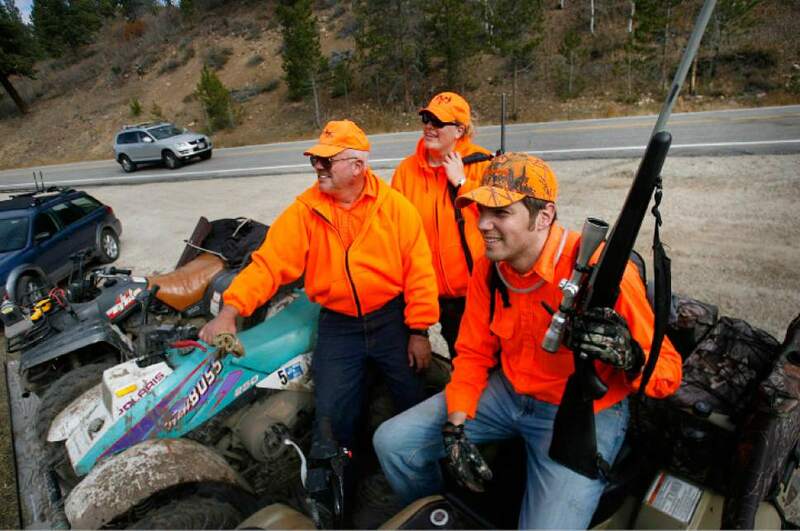 The 2008 general rifle deer hunt opened at dawn Saturday, with more than 60,000 annual participants. Photo by Leah Hogsten/ The Salt Lake Tribune [city} 10/18/08 Steve Griffin | Tribune file photo A Mule deer stands in a field in Bountiful near 1400 East and 250 North Tuesday Nov 17, 2009. Scott Sommerdorf | The Salt Lake Tribune Nicholas Smith, left, scans the hillsides near Kamas for deer as Shawn Gehring, right, looks on, Saturday, October 19, 2012. The general season rifle deer hunt opened at dawn Saturday with a new format that limits hunters to one of 30 units instead of one of five regions in the state. More than 52,000 are expected to be in the field. Scott Sommerdorf | The Salt Lake Tribune Lee Snelgrove, the mayor of Francis, with his son Curtis Snelgrove and daughter Tiffany Snelgrove pause while loading up their off road vehicle near Kamas, Saturday, October 19, 2012. The general season rifle deer hunt opened at dawn Saturday with a new format that limits hunters to one of 30 units instead of one of five regions in the state. More than 52,000 are expected to be in the field. 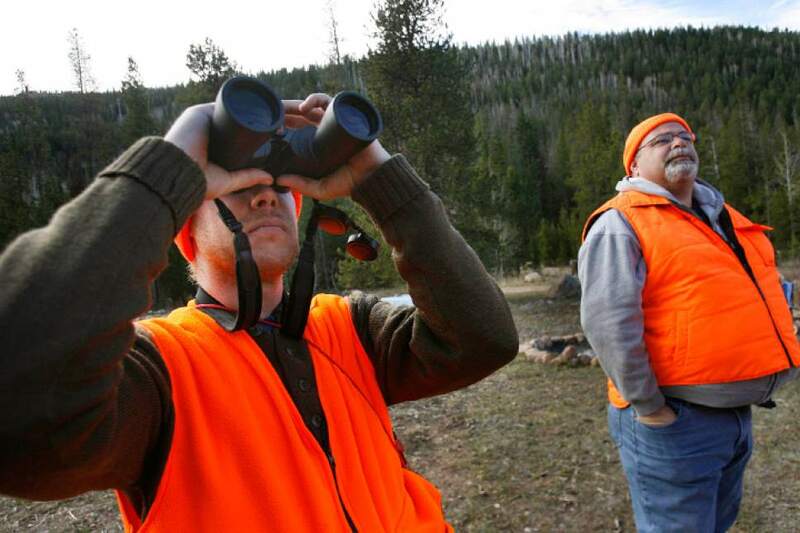 When 62,000 Utah deer hunters take to the field Saturday, they will see something hunters in other Western states will not: more deer. While surrounding states continue to document declining mule deer numbers, Utah&apos;s herds are growing. 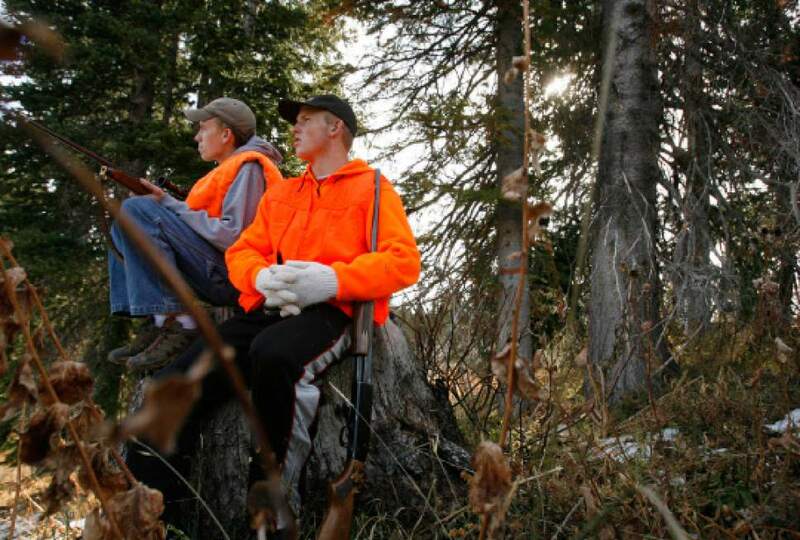 Biologists estimate a Utah deer population of 332,900 after the 2013 hunt. That&apos;s the highest number in more than a decade and the first consecutive population increase from one year to the next since 2006. At the same time, deer populations in other states continue to decline. Biologists for Western states say there are plenty of reasons why mule deer populations are generally shrinking, but most agree there are two things that maintain and grow stable herds: Mother Nature and a robust salad bar. In Utah, wildlife managers have focused on rebuilding mule deer habitat, spending more than $125 million over the past eight years. 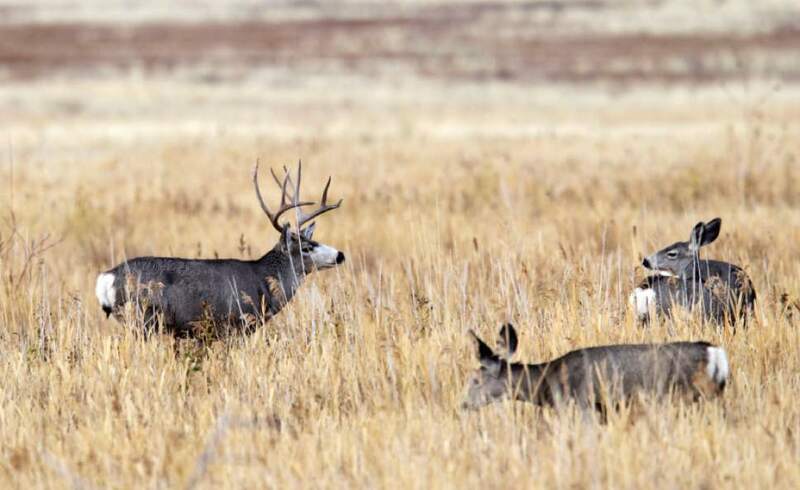 "We have had weather conducive to allowing mule deer to increase and we have done a heck of a lot of habitat work," said Bill Bates, wildlife section chief for the Utah Division of Wildlife Resources (DWR). "We can&apos;t control the weather, but we can set the groceries up for them." The struggle to maintain mule deer populations at just the right balance  not too many and not too few  has been going on for decades in the West. And the causes of mule deer population drops have long been identified. In 1976, wildlife managers gathered at Utah State University for a symposium on mule deer decline. The group produced a laundry list of obstacles: overharvesting, range reduction, habitat change from livestock and deer pressure, poor deer reproduction, urbanization, fire control and "efforts to reduce herds nearer range carrying capacity." Many big game managers today would add several other modern-day factors, including loss to auto/deer collisions, maladies like chronic wasting disease, oil and gas development and predation. Some states are coordinating wildlife management with transportation departments to create safe wildlife crossings at key areas. Conservation groups are asking land management agencies for responsible energy development. And researchers are working on disease and predation. But habitat restoration has been a struggle. Repairing lands damaged by fire, overgrazing and invasive species is expensive and in many states that habitat can become barren of wildlife. Under the vision of former Utah Division of Wildlife Resources director Kevin Conway, the state took a unique step in 2005 and formed a coalition of local, state and federal partners to work on habitat under the Utah Watershed Restoration Initiative. The initiative carries the lofty mission of providing solutions "for the serious statewide issues of conserving, managing and restoring Utah&apos;s vast and diverse watersheds by integrating the disciplines of soil, water, plants and animals." Wildlife resources managers head up the effort, but ranchers who graze their cattle on public lands also benefit from the improvements. Since 2006, the initiative has restored more than 1 million acres and spent more than $125 million. Another 197,100 acres are currently under restoration and 10,600 more acres have been proposed. Of the total spent, federal partners provided $69.5 million for the restoration projects from a mix of sources, including tag fees. And the state chipped in $42 million. Sportsmen&apos;s groups contributed close to $6.8 million. Federal agencies provided $6 million in in-kind contributions and landowners added another $2.6 million. Conway is largely credited with brainstorming Utah&apos;s unique approach to habitat restoration. He died of cancer in 2004. "Water is the lifeblood of wildlife and agriculture, and the combined resources of the partners built a strong program that has spun its own momentum," said Miles Morretti, who took over at wildlife resources after Conway died. He now is president and CEO of the nonprofit Mule Deer Foundation in Salt Lake City. The Mule Deer Foundation  dedicated to the conservation of mule deer and black-tailed deer and their habitat  pursues habitat restoration when possible, Morretti said. But the scope of Utah&apos;s program is hard to equal and it leaves other states wondering how to find similar results. "In Wyoming, we are keying in on the phrase that &apos;It is all about the fawns,&apos; " said Daryl Lutz, wildlife management coordinator for the Wyoming Game and Fish Department. Over the past 25 years, Wyoming&apos;s mule deer population has fallen by 32 percent. Lutz says those numbers correspond to lackluster fawn production during recent drought years. Biologists believe the magic ratio for a hunted mule deer population to sustain itself is 66 fawns for every 100 does. "Any change we see with mule deer recovery is likely based on fawn productivity and survival," he said. "Habitat is the key." Research shows the condition of does as they go into winter is a major factor in their ability to carry a fawn to birth and help it survive its first few months. Large areas of good habitat with native vegetation are vital. "You have to get fawns on the ground and then the other factors start playing into it," Lutz said. It takes time for habitat improvements to reap benefits, but wildlife officials and conservation groups hope restoration efforts will help deer get through the hard winters when they may have perished in the past. "People told us we might have to wait eight to 10 years to start seeing a response," Moretti said. "I&apos;m having a lot of guys telling me they are seeing a lot of twin fawns this year. We haven&apos;t seen that for a while. "When we get a hard winter, maybe we will see if this truly is a rebound," he added. "I&apos;m hoping it is." 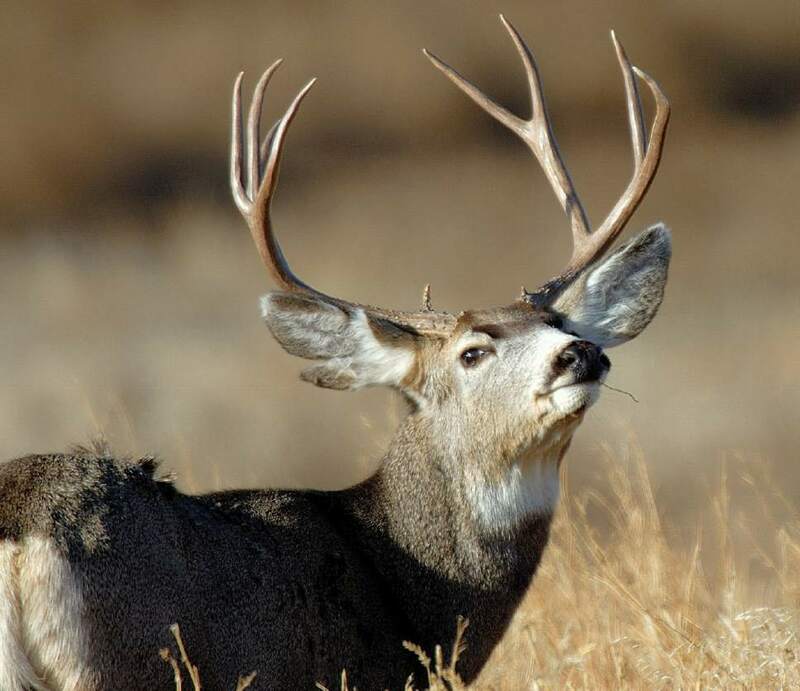 The Utah general rifle deer season runs Oct. 18-26. 84,000 • Number of deer permits (archery, muzzleloader and rifle) in 2014. $40 • Cost of a resident general season deer permit. Nonresidents pay $268. 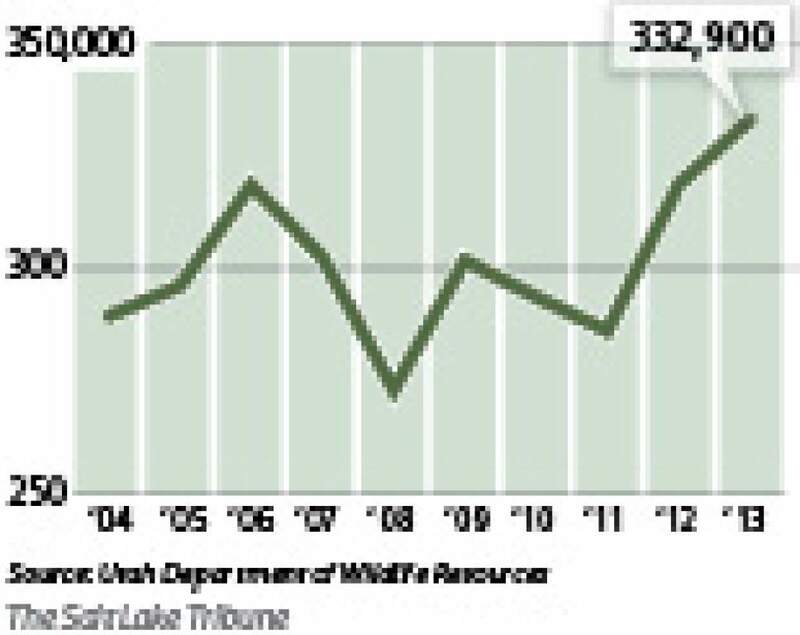 332,900 • Utah&apos;s estimated deer population after the 2013 hunt. 25,000-plus • Number of bucks killed among the 84,600 hunters on general season units in 2013.